HF radio and antenna blog by HL1ZIX / KE0EYJ. I removed the last two sections of the crappie spreader poles. I might put one back in, and use half of it, but it works now. 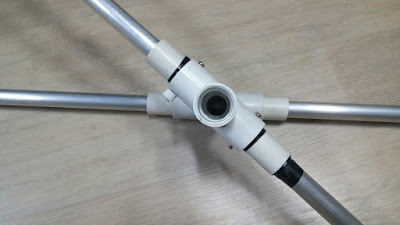 After having a great deal of success with a 20m moxon at my QTH, I decided to build a portable version, based on help from The Moxon Antenna Project by KD6WD. My goal was to be able to work from a small mountain near my home, and do so at QRO power levels, with a beam antenna. I also wanted to use up several scrap pieces of random PVC and pipe I had laying around. I recognized the 100w QRO power part of the goal when I added a 10Ah Lifepo4 battery, with a 20Ah BMS draw. With it, I can now operate for 3 to 4 hours at 100w typical hunt-and-peck SSB operation, along with some CQ'ing, before I have to drop wattage to 50w, or so. 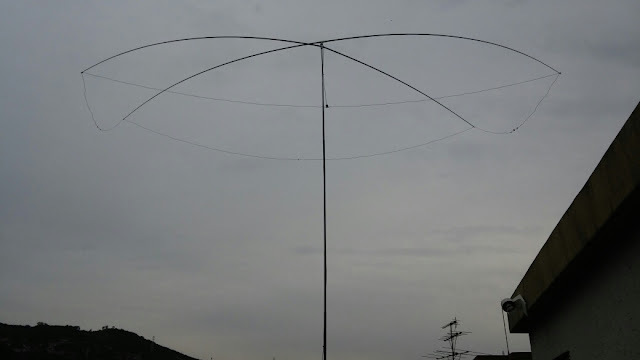 With the Moxon beam, created by Les Moxon, I will realize my goal, and have a portable antenna capable of being constructed in 20 minutes, and fully guyed to as high as 8m on my Spiderbeam mast, in under 30 minutes. I've been able to hit Europe with a 20m vertical dipole, and completed several 4.000-5,000 mile QSO's without much difficulty, from the mountain. To run a pile-up into the EU, however, I know I have to increase my power. There's no way for me to carry an amp (or to plug it in) on the mountain, so I was itching for a better antenna. Adding a moxon beam gives me almost 5db of gain -- the same as running a 300w amplifier from the top of the mountain, with the added advantage of improved receive! Another useful feature -- 5db of antenna gain will make a 30w signal sound like 100w (or if QRP, 5w becomes as 15w). That means I can run my portable rig on far less power, enjoy longer operation, and still complete the same QSO's as before... not to mention hearing (and contacting) others I was deaf to on a dipole. 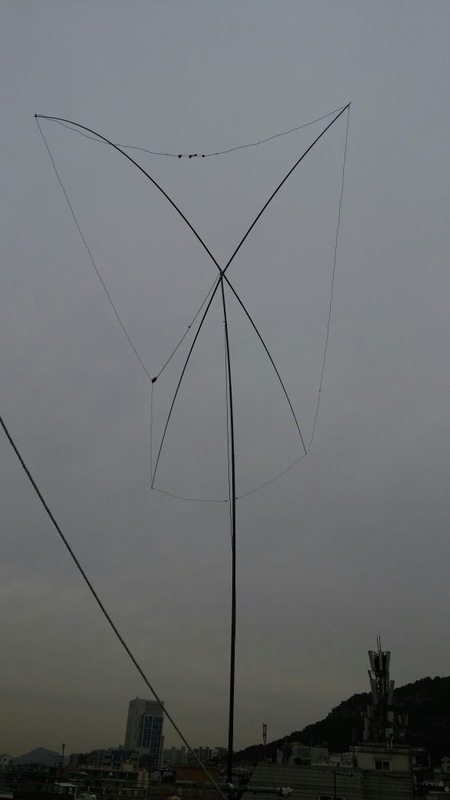 The Moxon is a really great antenna design. Its overall size is around 30% less than a full-sized beam. Depending on your choice, you may prefer this reduction in size, when you're working with an antenna as large as 20m band antenna are. A full-sized 20m 2-element beam is over 10m (32 feet) long, and 2.3m (7.54 feet) wide! The sad reality is, once you get larger than 15m, building a portable beam becomes a bit of a challenge. In any case -- please note that you may find constructing a basic 2-element 20m antenna even easier, depending on what's available to you. Both ideas are great! Another advantage of the Moxon is its wide bandwidth. This means, if you build it right, you will be close enough to work both 15m and 17m bands with the same antenna, provided you have a tuner. The SWR of those bands will vary on things such as wire size you use, but this antenna ends up 2.3 to 1 on 17m band, and about 3.4 to 1 on 15m. 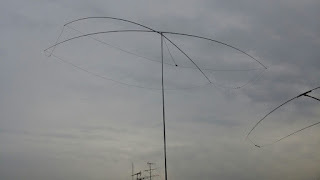 Even though there are losses experienced (and especially on 15m) at these higher SWR numbers, K5LJ showed that there is gain to be experienced with the 20m Moxon, even when working off-frequency: See "Gain Antennas: The 80% Solution" Part 1. Part 2. I'm not using window line, so my gain will be down a bit, but I'll still enjoy a few db gain over a dipole, on both 15m and 17m. The Moxon is recognized for about 10db higher front-to-back ratio, but is down about 1/2 to 1 db gain from a full-sized 20m beam (very small). In truth, I find that the difference in front-to-back is maybe not as much as touted. I have tried a few different 20m designs, and failed, because the parts I have available to me (or can find, I should say) are different than if I were at a Lowe's or Home Depot in the USA. I have to hunt around the city to find what I need. Also, I learned a lot about what wire size is going to work, as well as how much weight my cheap 5.2m (17 ft) crappie poles will take. 1. 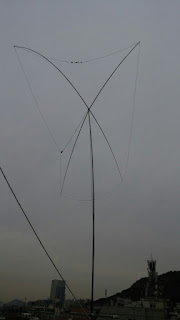 12m (21 foot) Spiderbeam HD mast. One of the few semi-light masts stout enough. A Sota pole or fiberglass flag mast will be too weak. 5. Two pieces of 36cm long, 20mm diameter aluminum element material. 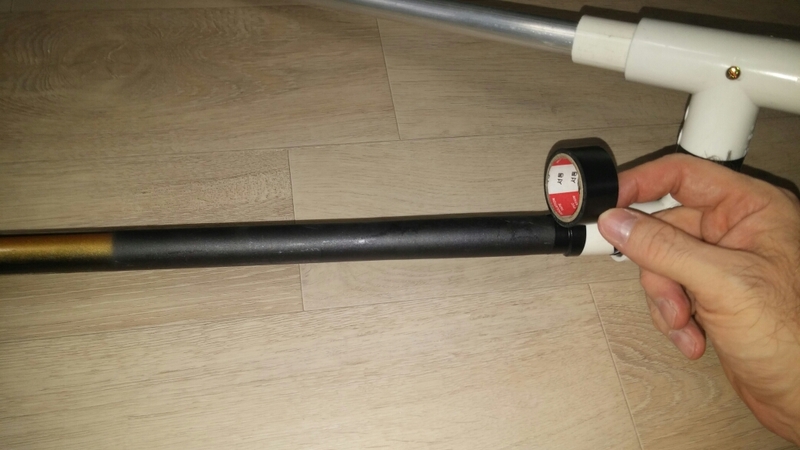 Size must fit snugly, but freely inside of the 3/4" (20mm) PVC pipe. 6. 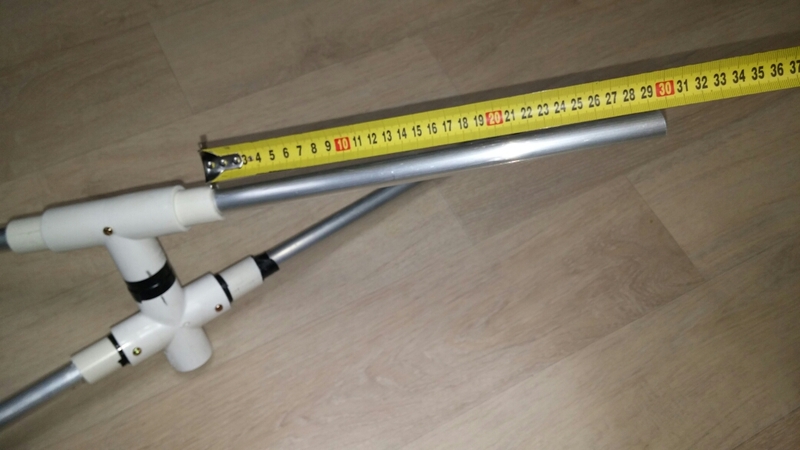 One longer piece of the same aluminum, but make it about 2 1/2 feet (75cm) long. 9. Some screws/nuts to hold the pipes and the PVC parts. 10. About 22m of 16awg or 18awg wire (extra added, for safety scrap). I was able to find some 16awg with a thin plastic shield. I recommend this. If not, you can get 18awg, but the thinner wire adds another .2 to .5db signal loss, and will lower bandwidth a smidge. 12. A small/light 100w 1:1 balun (I got a cheap one -- emphasis on cheap -- from Aliexpress for $12), or just a feedpoint connector and make your own ugly choke on the coax, near the antenna top. 13. A light plastic scrap long enough to measure and drill holes for the critical "end gap" where the elements nearly touch. 14. Four crappie poles of about 4.8 to 5m length NOT INCLUDING the thinnest throw-away segment. You'll note that the 4-way PVC has a hole in the bottom, where the mast fits in. 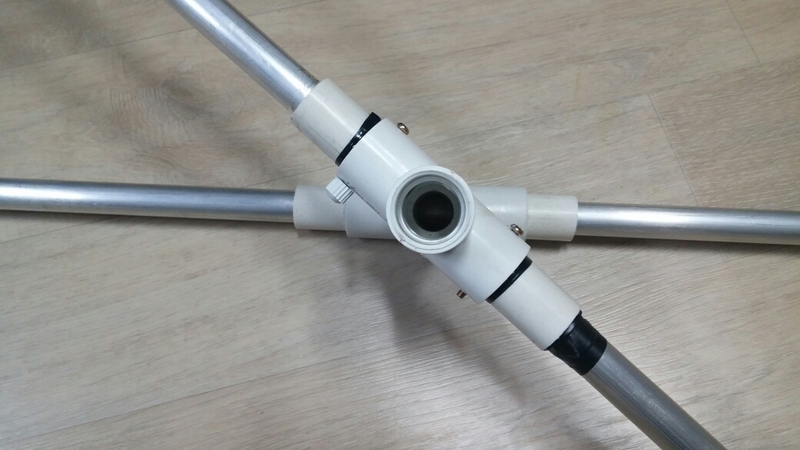 You can also replace the 3-way PVC "T" with another 4-way, and cut the top aluminum piece into two 36cm pieces. This will allow you to slide your mast all of the way through the top (I would have done this, but was limited to parts on-hand). The "X" you create must be at a 40 degree / 140 degree angle. That will give you the proper spread for the poles. I haven't done so yet, but I plan to drill holes and add long screws to lock the "X" together. I will also be able to take this apart, to save storage space in transport. I haven't completed that yet, so I just have it taped 40/140 degrees with electrical tape, to keep it from moving. The aluminum pieces are the right size to slide the open handle ends of the crappie poles onto. 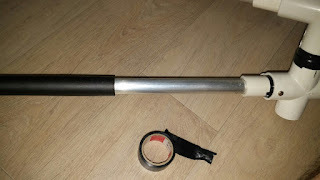 Again, you might have to improvise a bit, based on the size of your poles, the size of the aluminum piece you have, and how it fits into the PVC pipe X section you create. My crappie poles are 5.2m in length, but I throw out the last piece to be able to extend the moxon. In the photos above, I didn't use the final two pieces, but I will be putting one back in and using about 1/3 of it to hopefully straighten the sag. Given that my parts mostly are in metric, and found in Korea, you might have to experiment to find what works for you. I just use another wrap or two of electrical tape on each attached crappie pole, at this joint, to hold them to their respective PVC joint, when erecting. I remove this tape and throw it away, when taking the antenna down. Electrical tape is plenty strong to hold the pole to the PVC piece and over the piece of aluminum. The wire sizing was done using the Moxgen.exe program, available free online. If you use 16 AWG wire, with a thin PVC shield, you'll find the frequency ends up a 250 to 750 Hz too low. You can fold over the ends of elements about 5cm (for starters), and get closer to your target 20m SSB frequency. If your wire has a thicker plastic plastic shield on the outside, you may find your antenna frequency is even lower. This is all due to something called, "the velocity factor of the wire." Wire with PVC plastic on it will seem electrically longer than an equal length wire without it. The wire doesn't have to make a perfect rectangle. Just do your best. It can even sag here and there, such as with this antenna, so long as it's all within reason. These gap spacings are quite critical. 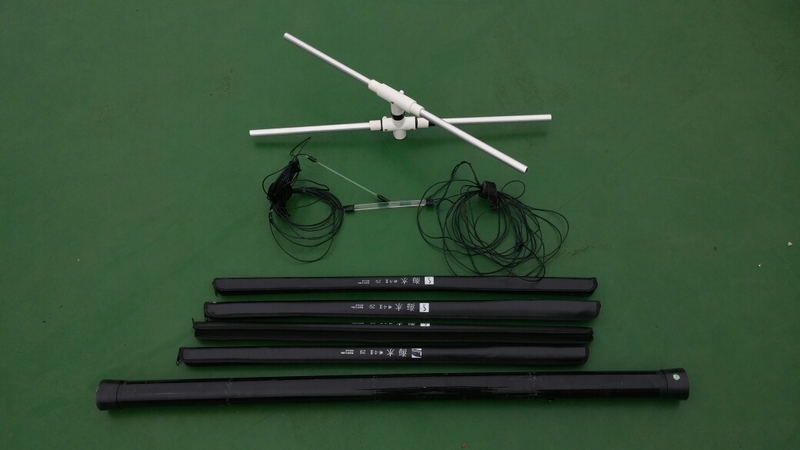 After calculating the wire sizes, and drilling the EXACT gaps in the pieces of light scrap plastic, you can measure and mark where the attachment points of the antenna wire will be to the ends of the poles. I measured and drilled holes at the exact spacing given in the Moxgen program, and left myself a bit of slack wire, for adjustment. I bent the wires into the holes, and taped over the small excess with electrical tape, to hold the wires in. If you have a few inches/several cm of extra wire, just wrap it back and around the element wire, then tape it tight so that it looks like one wire. The wire will appear electrically the length of the fold point (approximately). It's safer than cutting! After completing the center "X" with the added crappie poles, I begin taping the wire to the far ends of the poles, paying careful attention to where I marked, based on the Moxgen dimensions. You might find a more elegant solution than electrical-taping the wire to the poles, but hey -- I find it works, and just a few small turns of electrical tape holds it really well. The center feedpoint is pretty simple, here. Some build more permanent moxons with a PVC pipe attachment added to anchor the feedpoint. I find simply taping the coax to the pole, and angling it down to the feed, works fine enough. I used a cheap Aliexpress 100w balun here -- it's really a weak balun, but works as a feedpoint, if nothing else. You can do better. Next, mount the Spiderbeam 12mHD mast to tree trunk, or fence post. Lift the completed antenna over it, and and raise the correct-sized center pole fit inside (or through, if you built it with two PVC quad joints) the center "X" of the antenna. You might come up with a more elegant solution, but to keep the antenna from spinning around by itself, I use 5 to 10 turns of electrical tape to hold it to the pole. Spiderbeam sells some locking clamps for each section, but I find a stout twist and a few turns of electrical tape hold it well enough, in the case of light antennas. This is also faster. If you want to raise the antenna more than 5 or 6 meters, or if you have any wind, you will want to guy it. In fact, I would highly suggest doing so. I hope this project gives you some ideas. There are better designs, for sure, but I'm glad that it breaks down small enough to be carried in a backpack. The "X" can be broken down even further, if I want. Happy antenna building! Here's a Moxon video I made, detailing how to get started on your own moxon! For the last decade or so, since the Moxon Rectangle emerged as a compact full-size 2-element array of considerable utility, folks have searched for a means of nesting Moxons for more than one band. Despite G6XN's reported successful use of wave traps to isolate elements within a multi-band array, there has been little success in nesting rectangles that have been optimized for maximum gain, maximum front-to-back ratio, and a direct-feed 50-Ohm impedance. This report will examine some of the reasons why nesting Moxons is difficult. It will also describe a successful design that combines 17 and 12 meter Moxons in a nested pair with a common feedpoint. Moxon derived his rectangular tri-band array from the VK2ABQ square. Both designs used the coupling of parallel portions of a driver and a reflector element and the element-end coupling from the tails of the elements bent toward each other. The rectangle proved to have a higher gain than the square, while preserving a near cardioidal pattern with a very high front-to-back ratio. Since the early 1990s, I have refined the design of monoband Moxon rectangles to yield beams with about as much forward gain as a standard 2-element Yagi, but with only about 70% of the side-to-side width. The designs are quite broadband and are compatible with a 50-Ohm feedline. The result is an effective beam for the spatially challenged ham. However, the further stretching of the rectangle that produced these results presented a new challenge: nesting at least 2 Moxons on the same plane. Moxon "Christmas Trees" that provide vertical separation among antennas have been common, but trying to nest two Moxons proved detrimental to the performance of one or both antennas. As a sample of such a nest, let's put together fairly standard Moxons and see what happens. The following table lists the dimensions for the two bands, using what has become standard notation. In this and all of the design models for this report, the 17-meter elements average 0.75" in diameter, while the 12-meter elements average about 0.5" in diameter. A is the total side-to-side dimension. B is the length of the fold-back driver tail. C is the gap between tails. D is the length of the fold-forward reflector tail, and E is the length of the entire array from the driver back to the reflector--the sum of B, C, and D. Because we have nested the Moxons, I have added the dimension DR for the distance between the two drivers and the dimension RE for the distance between the two reflectors. I have also appended as a reference a guide to dimensions (Fig. 15) at the end of this report. At my web site (../moxon/moxpage.html), there is a ready-to-use calculator for entering the design frequency and the proposed element diameter to arrive at monoband Moxon dimensions. As well, a number of stand-alone programs and equation-based models also exist for this purpose. Free-space E-plane or azimuth plots of the band-center performance of each array may give the illusion that we have a successful nesting. See Fig. 1. The patterns give the impression that we have an operable array with only a modest reduction in front-to-back ratio on the upper band. However, seeing the same data in tabular form, supplemented by feedpoint information, may give another impression altogether. Although the performance promise is high, feeding the 12-meter rectangle poses a totally unsatisfactory problem. Let's see why. As shown in Fig. 2, the relative current magnitude distribution on 17 meters is virtually normal. Although there is measurable current on the 12-meter driver, it is sufficiently low that one can arrive at a 50-Ohm 17-meter feedpoint impedance by very small element adjustments that do not disrupt performance. However, on 12 meters, the situation is quite different. From its interior position, the 12-meter rectangle excites the 17-meter elements--both fore and aft--to very significant levels. The current levels are high enough to prevent the array from achieving anything close to a 50-Ohm feed impedance until the performance pattern is wholly unacceptable. The proximity of the parallel portions of the elements for each band prevents us from effectively isolating them on the upper band. The is a technique for ameliorating some of the effects of the close proximity of the Moxon elements. Fig. 3 shows the method in the form of an outline sketch. In the sketch, we have the same two rectangles, with only slight modifications to the dimensions, as shown in the following table. We have adjusted the tails and the gap of the 12-meter antenna to suit the new feed conditions. As shown in the outline sketch, we use a common feedpoint on the 12-meter driven element. Between that point and the 17-meter feedpoint, we run a length (1.15') of 70-Ohm, 0.8 VF transmission line. The impedance and velocity factor values reflect foam versions of either RG-11 or RG-59. The phase line must be "normal," that is, the center conductor and the braid attach to the left or right sides, as applicable, of the drivers for both bands. Reversing the line at only one end disrupts its ameliorative action. Interestingly, the use of the common feedpoint and phase line does not significantly alter the current magnitude distribution on the array elements. However, it does make a significant alteration in some of the current phase values, and this change makes all the difference. The following table shows the modeled relative current magnitude and phase at the element centers for the independently fed and common-feed arrays. There is not much difference in the relative driver current magnitudes or phase angles. However, the reflector phase angles have changed significantly. This change is reflected in the performance figures for the array, shown in the following table. Although we have now obtained satisfactory feedpoint impedances on both bands, we have sacrificed performance. We have lost a half-dB of gain and about 5 dB of front-to-back performance at 12 meters, relative to the independently-fed but unfeedable version of the nested array. However, if these performance losses are not considered severe, then this version of nested Moxons is suitable for building. To test whether or not these dimensions are excessively finicky, I ran a 400-kHz frequency sweep of the array on both bands. Fig. 4 shows the gain and the relevant front-to-back ratios (180-degrees and worst-case) on 17 meters. The gain curve is completely normal for a 2-element parasitic array with a driver and reflector. It is also normal relative to monoband Moxon rectangles. The front-to-back ratios peak on the upper band edge but have more shallow curves than most monoband Moxons. In Fig. 5, we find the corresponding curves for the 12-meter performance. The close coupling of the two array reduces gain and makes its curve sharper than normal Moxon gain curves. The peak is below the lower end of 12 meters but within the sweep passband. Because the front-to-back region shows only a single bulge and is fairly low, the 180-degree front-to-back curve is coincident with the front-to-sidelobe curve that indicates the worst-case front-to-back ratio. As well, the weaker values yield a quite shallow curve across the sweep passband. The 17-meter (Fig. 6) and the 12-meter (Fig. 7) graphs of the feedpoint resistance and reactance are both very well-behaved--a key benefit of using the common feedpoint and phase line system. The 17-meter 50-Ohm SWR curve never rises above 1.45:1. However, the 12-meter curve is considerably steeper. Nevertheless, since the sweep passband is 4 times the width of the actual 12-meter amateur band, there is considerable leeway for construction variables without jeopardizing the ability to effectively feed the array with a 50-Ohm coaxial cable. To improve the performance of the 2-band array would require a design revision that further separates the parallel portions of the drivers and the reflectors. Most strategies applied to nested Moxons have concentrated on modifying the inner or high-band Moxon, since it shows the greatest departure from monoband performance. However, we might begin to focus on modifying the low-band or outer Moxon instead. If we maintain a standard design for the Moxon, effecting increased separation between drivers and reflector involves returning the rectangle toward its squared origins. Widening the space between the driver and the reflector of a Moxon rectangle has two major effects. First, it reduces gain. A fully square VK2ABQ array loses about a full dB of gain relative to the Moxon. As well, the feedpoint impedance increases. So this direct of effort will only lose us the gain that we lost in our first successful nest and a little bit more. As well, we shall lose our 50-Ohm impedance match. Now a side-note to prove that one sort of misunderstanding can lead to a different sort of understanding. 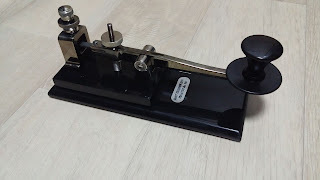 I was reviewing the model of a recent OptiBeam commercial antenna which used a Moxon rectangle on 20 meters and a loaded Moxon for 40 meters. The main decoupling devices are stubs past each mid-element load, for which the designers have made patent application. The design also called for wider separation between element tails. (Since a loaded antenna normally results in a reduced feedpoint impedance, the wider gaps were required to raise the impedance back to 50 Ohms.) Between the tails, for mechanical support reasons, they introduced metallic tubes with insulators at each end. My initial reaction was to interpret the new tubes as element end coupling wires to distribute the capacitive coupling of element ends in a series manner. However, Tom Schmenger, DF2BO, of Optibeam assured me that they were not part of the decoupling system. My secondary reaction was this: the tubes could be part of the decoupling system. Suppose that we increased the spacing between elements just far enough to minimize the interaction between the drivers and reflectors for the two bands. To assure adequate element end coupling, we would introduce short elements--which we can call end-coupling wires--to sustain the element end coupling. What we would lose is some of the front-to-back ratio, which is dependent upon both the end coupling and the coupling between parallel portions of the elements for a given band. However, what we might gain is more satisfactory performance for the array's gain and for the feedpoint resistance and reactance. We can see the elements of the resulting array in the outlines of Fig. 8. The array is about 4' wider (front-to-rear) than our original nest. Note that we have retained the common feedpoint and the 70-Ohm, 0.8 VF line between the driver feedpoints, and feed the 12-meter element. Again, reversing the phase line harms performance. The line length is now 3.15'. To provide dimensions (see the appended Fig. 15), we must introduce 2 new dimension terms. We now have gaps C1 (driver-to-coupling wire) and C2 (coupling wire to reflector). Of course, we also must specify the length of CW, the coupling wire itself. 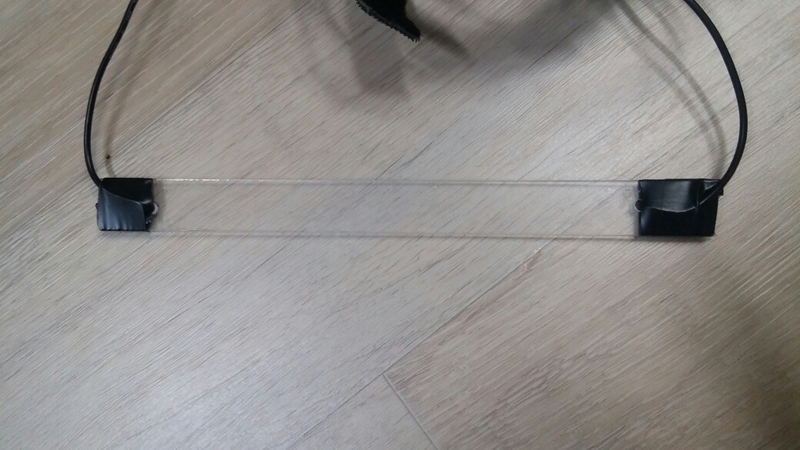 The coupling wire is the same diameter as the element tails. That the system does isolate the high- and low-band elements becomes apparent from the relative current magnitude curves in Fig. 9. Indeed, the current ib the inactive elements due to coupling to the active elements is nearly equal for operation on both bands. The general properties of the antenna patterns appear in the free-space E-plane or azimuth patterns for the centers of the two bands. As shown in Fig. 10, the 12-meter curve is completely normal for a monoband Moxon rectangle. However, as we surmised from pre-design analysis, the rear lobe of the 17-meter Moxon is significantly larger than that for the 12-meter rectangle. Nonetheless, mid-band performance--especially on the less-active 12- and 17-meter bands seems to be quite adequate for a 2-element array. The following table of performance values derived from the models will bear out this conclusion. The 12-meter performance is Moxon-normal. The 17-meter performance has restored virtually all of the rectangle's gain, while its front-to-back ratio is over 2 dB better than the 12-meter value for our initial common-feed nested Moxon pair. The feedpoint impedances are well within acceptable levels. To test whether the array is buildable or simply too finicky for practical basement construction, let's sweep the array on both frequencies. We shall use the same 400-kHz sweep range that we applied to the initial nested pair. Fig. 11 gives us the gain and front-to-back information for 17 meters. The gain curve is once more normal for a parasitic 2-element driver-reflector array. The 180-degree and worst-case front-to-back curves coincide in a very shallow and stable value set that reflects the wider element spacing. We might classify these curves as "well-behaved." The corresponding 12-meter curves in Fig. 12 are equally well-behaved, although the front-to-back curves are more Moxon-esque, with a peak just below the lower end of the amateur 12-meter band. Even the worst-case curve is greater than 20 dB at both sweep passband edges. The gain curve is also completely normal. Since the 50-Ohm SWR curve for 17 meters is shallow, as shown in Fig. 13, I thought it unnecessary to further modify the outer array to seek a perfect 1:1 value within the amateur band. Some slight tweaking may be possible, but it will involve juggling not only a driven element overall length, but as well, the length of the coupling wire. It is likely that under any modification, the very small gaps at each end of this wire will remain fairly constant at around 0.1' (between 1.2" and 1.4"). Nonetheless, the rates of change for both the resistance and reactance are quite tame. The SWR curve for 12 meters, shown in Fig. 14, is a bit steeper, although it bottoms out just below the low end of the amateur band. The chief source of the steeper--but entirely acceptable--curve is the rate of change of resistance. This higher rate of change is a function of the closer spacing between the driver and reflector on this band. I am placing the dimensional guide to the main variations on nested Moxon arrays (Fig. 15) at this point, since it functions more as a reference than as array information. There is a third alternative for a nested pair of Moxon rectangles--using our designated 17-meter and 12-meter pair. This alternative employs 1/8-wavelength stubs somewhat after the fashion of the OptiBeam 40-meter-20-meter combination. However, unlike the Optibeam 40-meter antenna, our 17-meter Moxon is not loaded. As a result, we can place the stubs close to the feedpoint of the antenna, as shown in the tilted-image sketch in Fig. 16. Ideally, the stubs should be as close as feasible to the feedpoint. However, to ensure that the feedpoint of the driver has equal length segments on either side of the source segment, the stubs begin about 0.7' each side of element center. As well the 17-meter feedpoint is an indirect one, being the termination of a 70-Ohm, 0.8-velocity factor line from the combined feedpoint on the 12-meter driver. The line length in this case is 1.23'. The following table provides complete dimensions for the new nested array, including the distances between drivers and reflectors and the stub lengh. The stubs are almost exactly 1/8-wavelength long at 24.94 MHz. The initial model used 0.1" diameter stub elements. However, varying the diameter up to 0.25" yielded virtually no change in the required length for optimal performance on each band. You may also note that this array requires modification of the dimensions used for the stub-less nested Moxon array. The stubs alter the pattern of coupled current magnitude and phasing on the 17-meter elements when the antenna is operated at 24.94 MHz. See Fig. 17. As the 12-meter current magnitude distribution curves show, even stubs do not effect complete isolation from significant coupling. Instead, they tend to render the coupling less troublesome to effective operation. The net result is reasonably good performance on both bands, although--as shown in the following performance table--the front-to-back ratio at 12 meters does not quite match that on 17 meters. Nonetheless, it is superior to the front-to-back ratio for either of the preceding alternatives when reference to the non-optimal band. The values of maximum forward free-space gain in parentheses are adjusted figures based upon the AGT value for the model at each design frequency. Despite the use of a stub element that differs in diameter from the main elements, the NEC-4 AGT at 18.118 MHz was 1.034 (gain high by 0.14 dB) and at 24.94 was 0.974 (gain low by 0.11 dB). Fig. 18 provides us with free-space E-plane or azimuth patterns for the array at each design frequency. In all of the non-optimal azimuth patterns, one may notice that with lowered front-to-back values, the beamwidth and overall cardioidal pattern shape diminished relative to the pattern under optimal Moxon conditions. As we did for the other major nests of 17-meter and 12-meter Moxons, we ran a frequency sweep of 400 kHz, with the relevant amateur band roughly centered in the sweep. The 17-meter gain and front-to-back data are in every way normal for a Moxon rectangle, despite the presence of the stubs, as shown if Fig. 19. The rates of change of gain and of both the 180-degree and the worst-case front-to-back ratios are comparable to those of a monoband version. However, it is easier to center the peak front-to-back ratio and the SWR at the same frequency in a monoband version of the antenna. The comparable gain and front-to-back data for the 12-meter elements, as they appear in Fig. 20, show reductions in bandwidth, despite the shallower front-to-back curves which overlie each other. The highest gain occurs very close to the lower edge of the sweep passband and peaks well below the value of a typical monoband rectangle or of a rectangle with better isolation between the lower- and higher-frequency elements. The resistance, reactance, and 50-Ohm SWR curves in Fig. 21 show that the close coupling of elements--despite the isolation effected by the stubs--still presents a fairly steep SWR curve on 17 meters, although the value remains below 2:1 across the swept passband. The culprit is the resistance, which does not reach 50 Ohms at the design frequency. Nonetheless, a good SWR value within the 17-meter band is easily obtained. On 12 meters, as shown in Fig. 22, the situation differs, but in a manner parallel to the gain values in Fig. 20. 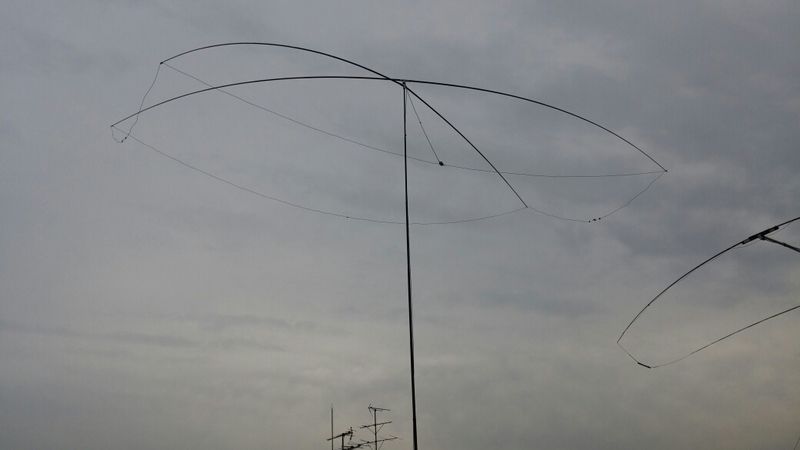 Like the rapidly changing gain, the resistance changes value more rapidly with frequency than for a monoband 12-meter Moxon. As well, it also does not rise to 50 Ohms until well-above the 12-meter amateur band. Hence, the 50-Ohm SWR curve is quite steep below the design frequency. Under these conditions, the 12-meter portion of the array has a narrower operating passband than does the 17-meter portion. The stubbed and nested pair of Moxon rectangles offers a more compact arrangement than the modified array, but remains under the influence of mutual element coupling based on element proximity. However, it offers better 12-meter performance than the un-stubbed version of the compact arrangement. The trade-off is a somewhat narrower operating range. Any of the variations on the nested Moxon pair is likely to serve quite well on 17 and 12 meters for the space-starved modern amateur. The modified outer Moxon version has slightly better performance figures than the unstubbed common-feed array but not as good as the stubbed array. The cost to the modified design is two lengths of tubing and 4' of front-to-rear width. The stubbed array, however, has a narrower operating bandwidth, which translates into somewhat more finicky construction and adjustment than the other two versions. In all three cases, the common feed with a phase line is not merely a convenience. It is a necessity to drive the arrays to their performance potential. Translating these designs to available materials will likely require considerable design effort and a reliable modeling program. NEC-2 does not provide accurate results if one uses several diameters of tubing for the elements, since the corner bends will prevent the Leeson correctives from activating in either EZNEC or NEC-Win Plus. These correctives only activate with symmetrical linear elements. Perhaps the most effective work-around is to re-design the array using the average value of diameter with uniform-diameter modeling elements. The results will be accurate for that diameter, but not exact for the actual tubing sizes used. Nonetheless, our analyses suggest that the design is not so finicky as to prevent fully adequate performance. Perhaps--as in all Moxons--the most critical dimension is the gap (or the gaps). I would also not recommend nesting Moxons in any of these systems for adjacent bands, such as 12 and 10 or 15 and 17 meters. The drivers and the reflectors for each band are that much closer together, with stronger interactions. However, skipping a band makes a 20-15 or a 15-10 version of the array entirely within the realm of practical feasibility. We have not seen the last word on nesting Moxon rectangles. The techniques used in these designs simply contravene my earlier experience in which the nesting problem seemed insurmountable. However, I always expressed my frustration in terms of not "yet" finding a way to effectively nest Moxons. I now have three ways to do that, even if none of them is absolutely optimal. But, then, the future offers plenty of time to more closely approach the ideal of nested Moxons such that each rectangle in the nest performs like a monoband version. Very nice design. Looks completely doable for any Ham wanting to make a light, efficient antenna. Thanks for the article! Thanks! I just followed ideas on "The Moxon Antenna Project" and modified, based on parts available. Not pretty, but it works! Does your Icom 7300 suffer from low average power output? Don't mod -- try this!